The following links will help you learn about and connect with the Episcopal Church and the larger Anglican Communion. 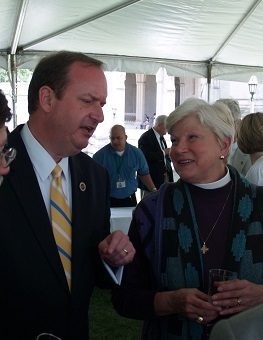 Parishioner Craig McKee helping represent Indiana at Major States Day, National Cathedral, 2007. Indianapolis Diocese. St. Stephen’s is a part of the Indianapolis Diocese. Waycross Camp and Conference Center. Waycross is a wonderful camp that is a ministry of the Indianapolis Diocese. The Episcopal Church. Home of our national church. US National Cathedral. Fantastic website with virtual tours of our National Cathedral. Episcopal News Service and Episcopal Life. Episcopal News from the National Church website. Episcopal Relief and Development Fund. A ministry of the whole church for the whole world. Peek through the Window. An excellent website with a great deal of information about the Episcopal Church. It is especially informative for those investigating the Episcopal Church. Red Book. Locate an Episcopal church in any part of the USA. Archbishop of Canterbury Justin Welby. Anglicans Online. This is one of the most comprehensive sites for all things Anglican. It is updated every Sunday evening. Anglican Communion. The worldwide of home of the Anglican Communion. Anglican News Center. This is the news section of the Anglicans Online website. 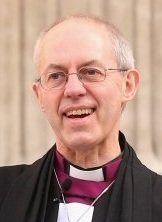 Archbishop of Canterbury. The official website of Justin Welby, Archbishop of Canterbury. Church of England. The Home of the Church of England. Thinking Anglicans. Excellent Anglican news site. Book of Common Prayer Online. An online version of the 1979 Prayer Book that can be browsed with your web browser. NRSV Website. A useful source of information about the recommended translation of the Episcopal church.